An immunohistochemical method was developed to detect histamine in tissues. 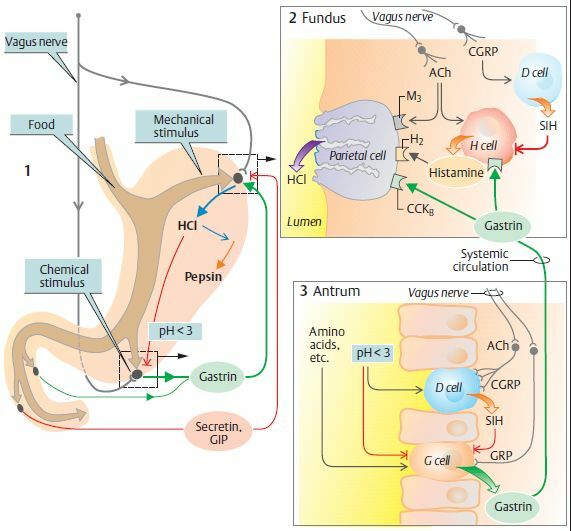 The aim of this study was to reveal the cellular stores of histamine in the gastrointestinal tract, pituitary, and adrenal gland. Histamine-containing nerve fibers were found in both rat and guinea pig gut. The origin of at least some of these fibers in the rat ileum was the submucous ganglion cell layer. In the rat stomach, numerous enterochromaffin-like cells exhibited histamine immunofluorescence, and endocrine cells in the ileum and jejunum contained histamine. Only mast cells contained histamine in the neurohypophysis. A large number of process-bearing cells in the guinea pig but not in the rat adrenal medulla contained histamine. The study shows that histamine is present in peripheral nerves and endocrine cells in addition to mast cells, and may function as a neurotransmitter or hormone. The statin-induced inhibitory action may be mediated by the suppression of geranylgeranyl transferase via the depletion of intracellular mevalonic acid. Gagnemo-Persson R, Persson P, Bryngelsson T, Green B, Hakanson R.
Rat stomach ECL-cell histidine decarboxylase activity is suppressed by ergocalciferol but unaffected by parathyroid hormone and calcitonin. Regul Pept. 1999 Feb 5;79(2-3):131-9. Hypothalamic neuronal histamine regulates sympathetic nerve activity and expression of uncoupling protein 1 mRNA in brown adipose tissue in rats. Yasuda T, Masaki T, Sakata T, Yoshimatsu H.
Department of Internal Medicine I, Faculty of Medicine, Oita University, 1-1 Idaigaoka, Hasama, Oita 879-5593, Japan. To clarify how hypothalamic neuronal histamine regulates peripheral energy expenditure, we investigated the effect of infusion of histamine into the third cerebral ventricle or discrete hypothalamic regions on sympathetic nerve activity and expression of uncoupling protein 1 (UCP1) mRNA in brown adipose tissue (BAT). Infusion of histamine (200 nmol) into the third cerebral ventricle of anesthetized rats significantly increased the electrophysiological activity of sympathetic nerves (P<0.01) and UCP1 mRNA expression in the BAT (P<0.05). Microinjection of histamine (10 nmol) into the paraventricular nucleus (PVN) and preoptic area (POA) produced similar significant increases in BAT sympathetic nerve activity (P<0.01 for each). By contrast, injection of histamine into the ventromedial hypothalamic nucleus or lateral hypothalamic area had no effect. We conclude that hypothalamic neuronal histamine may regulate energy expenditure in BAT through the activation of sympathetic nerves. The PVN and/or POA appear to be the principal hypothalamic sites that mediate the stimulatory effect of histamine on this efferent pathway. Cofactor for gaba, dopamine and histamine? 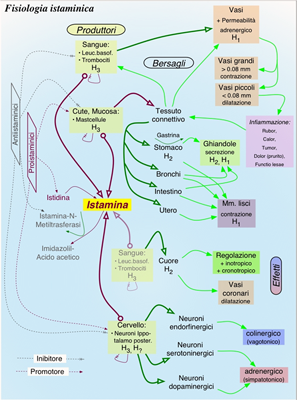 The pathway of histamine synthesis stimulation and inverse agonist through histidine decarboxylase (HDC). Up-regulation of H1-histamine receptor is induced by IL-4 through the activation of H1-histamine receptor genes and histidine decarboxylase gene. Antihistamines has a mechanism to inhibit the up-regulation of H1-histamine gene expression and suppress histamine basal signal through inverse agonistic activity. Downregulation of H1-histamine gene expression by antihistamines occurs through suppression of histidine decarboxylase and IL-4 gene transcription. The results suggest that histamine may modulate anxiety via H1 but not H2 receptors in the rat central amygdala.